Bahamas blue hole dives are easily the most unique and signature scuba dives anywhere in the islands of the Bahamas. Basically a massive underwater sinkhole, the blue holes are deep marine habitats for large species such as sting rays, sea turtles, grouper, reef and pelagic fish species. Our Bahamas Lost Blue Hole dive, departing out of Nassau Bahamas, will be one of the most unforgettable and awe-inspiring dives you might ever go on! Do not miss your chance to experience what has become the Bahamas’s most signature and iconic dive destinations. Our Lost Blue Hole Dive departs several days a week. We head to a natural blue hole that likely was formed during the ice age. 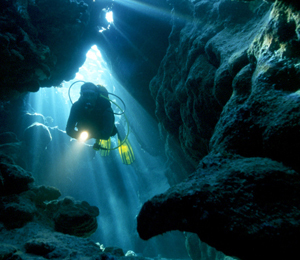 Diving at the blue holes are similar to cave but not quite, as these holes have more characteristics of a sinkhole than a normal underwater cave. They acquire their names from the stark contrast between the dark blue water seen where the hole is located and the light greenish-blue water of the rest of the ocean. The Lost Blue Hole, the site we go to, is about 100 feet across and about 200 feet deep. The perimeter of the hole is found at about 40 feet depths. This dive excursion explores the Lost Blue Hole at about 90 feet of water. While some blue holes are not known for their, this particular blue hole is actually home to a decent variety of marine species including sponges, coral, reef fish, pelagic fish, shark, grouper, stingrays, and even large sea turtles. We only do the Lost Blue Hole Diver certain days out of the week, so make sure to book your reservation well in advance and if you are uncertain if we are operating on a specific date, just call our office. The second dive after the Lost Blue Hole is typically to the Barracuda Reef, one of the area’s most thriving and healthy coral reef systems. Do you have nitrox tanks for this dive? No, unfortunately for this particular dive we do not have nitrox tanks. I have been to the Bahamas many times, but Bahamas Lost Blue Hole Dive is one of my favorite trips! It includes everything that everyone should do here. As a Bahamas veteran, I can say only the best about this experience!